ADD BACK ISSUES OF VIBRANT GIRL TO YOUR COLLECTION... OR GIFT ONE TO A FRIEND! Join Vibrant Girl Magazine as we explore what it means to be designed by the Creator of the Universe. Together we’ll dig into Bible passages from Genesis, to Psalms, to Ephesians. Along the way we’ll learn about the design in color, repurpose old yard sale items, and enjoy a short story adventure with over 40 illustrations. What does it mean to be an intercessor? How can we step in for a friends who are hurting? 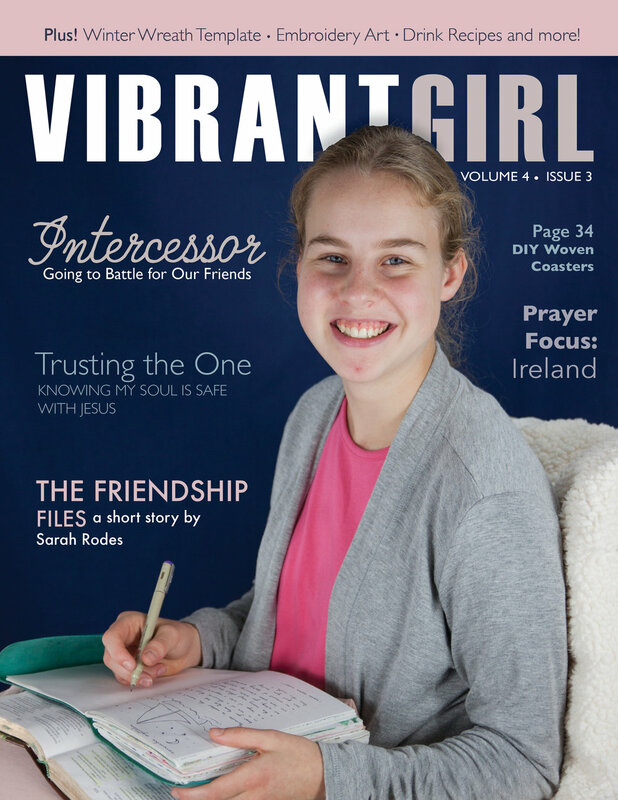 In this issue of Vibrant Girl we’ll learn about the special battle each of us is called to to join. Plus, we’ll learn how we can pray for a country across the ocean, weave our own coasters, create embroidery art, sip hot drinks while reading a short story by Sarah Rodes, and so much more! What is God’s purpose for the arts? How do we fit into the Master Painter’s picture? How can we encourage others with our creativity? Open this issue, and we’ll explore some answers to those questions together! Inside you’ll find the article “God of Beauty and Art” by Rosina Schmucker, advice to help you better understand three classic forms, and artwork around every corner. Plus, tips for cupcake decorating, table setting, choosing music, and more! Come along in this summery issue as we visit the beach (in our own backyards! ), cool down with water balloon games, and invent ice cream sundaes. We'll learn how to treat everyone around us with kindness and equal love. Plus, guest writer Londa Yoder shares about life with her loyal, sunshiney brother with Down Syndrome, team member Savannah shares ideas for creative letter writing...and much more! We, as daughters of God, don't belong to this world. We're just passing through, our real home is heaven. This issue is both a call of comfort for when we ache and long for home, and a call to stir up when we find ourselves too comfortable here. Join us as we learn how seeing ourselves as "sojourners" impacts how we live. Plus, we'll also take a look inside a renovated 1975 camper, build an outdoor hideaway, and more! 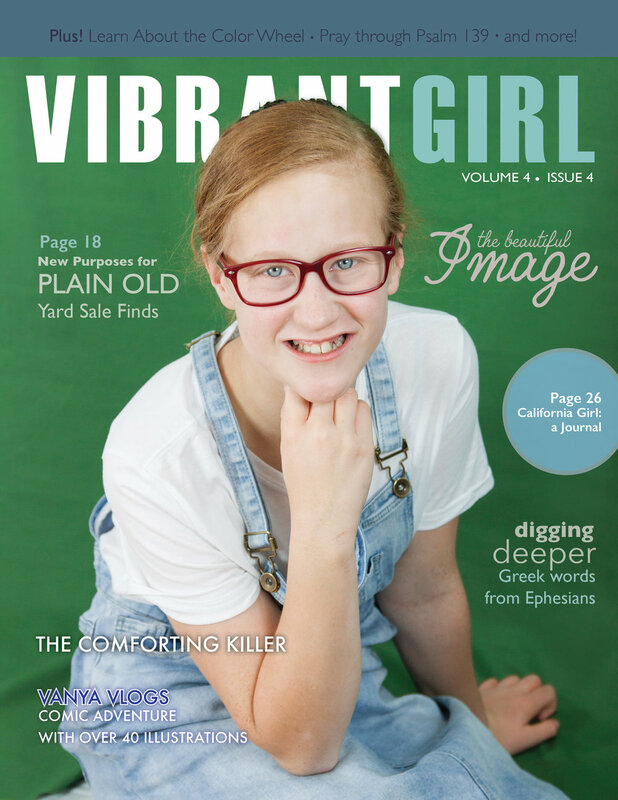 This issue of Vibrant Girl Magazine is all about mothers and daughters. Cultivate the gift of a meaningful relationship with your mom, work through conflict, and find God in the midst of loss. You'll also find a photoshoot based on the classic book, Little Women (with quotes from "marmee"), tips to improve photography, watercolor notecards, spa recipes, and more! Ready to jump in and embrace living fully alive? Together, we'll learn what that looks like in both good times and tough times. Get to know a girl with a lung disease, discover 5 ways to help a hurting friend, soak up God's blessings with thankfulness, and invest in the two things what will last eternally. Plus, take a trip into the city, make your bedroom brighter, design your own shoes, make a scrapbook, solve two puzzles, and much more! Gather together as we take a look at meaningful friendships. Discover how, like gardens, relationships take careful cultivation. Bring back the lost art of conversation, see what readers are saying about their friendships, meet girls from seven different countries around the globe, dive into DIY tutorials, and throw a friendship garden tea! This packed issue focuses on the Word of God. We'll take a journey to the land of Israel, gain 17 helpful hints for Bible Memory (plus 26 cut-out memory cards! ), create Bible word art, enjoy a retelling of the exit from Egypt (through the eyes of a slave girl! ), and discover 3 incredible reasons to depend on the Bible as the true written Word of God! Join your friends at Vibrant Girl in reaching out in love to the world around us. This issue focuses on being a servant and discovering how girls can make a difference for Christ. Together, we will learn (in an age-appropriate manner) about problems in our world such as Human Trafficking. We'll also gain tips and ideas for babysitting, stay inspired with 7 bonus cut-out quotes, learn to arrange a springtime bouquet, find 5 tea party recipes, and more! REDUCED - $7.00 - Purchase Now! Vibrant Girl Magazine kicks off with a premier issue centralized on the topic that the rest of our magazines our built upon; grace! In this colorful issue, we discover God's redeeming grace in our own lives as well as learn to extend that grace to people around us. Plus, come along with Kylie Wilson on an exciting family road trip, beat summer boredom with a fun checklist, have a pretty and classic picnic, and so much more! * Note: Prices shown for United States shipping only. Canadian Shipping options available in check-out window. Individual issues and bundle deals available only while supplies last.